The COROT space telescope has revealed the existence of CoRoT-Exo-4b, a new and rather unusual extrasolar planet. Its orbital motion appears to be synchronous with the period of rotation of its parent star. Like the other planets COROT has discovered, CoRoT-Exo-4b is roughly the same size as Jupiter and is close to its parent star. Unusually though, the planet and star form a system with unprecedented dynamic properties. 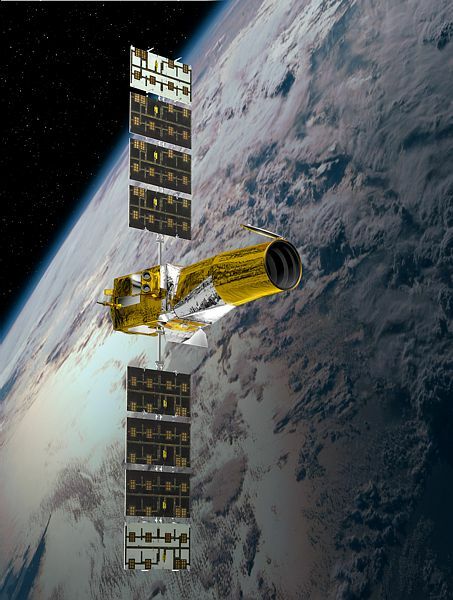 The COROT space telescope has been surveying the stars since 2006. Credit: CNES/Ill. D. Ducros. The scientists could hardly believe their eyes. “In principle, synchronization in a system like this is impossible because the planet is much too small and too far from its star for them to interact in this way,” explains Olivier Vandermarcq. The COROT science team at CNES will be studying the observations carefully in order to unravel this mystery. COROT is the first space telescope designed to detect exoplanets. “Most of the discoveries so far are giant planets. But COROT is equally capable of observing smaller planets as well, with radii of just 1.5 times that of Earth. That will be a major first,” enthuses Olivier Vandermarcq. Light curve of CoRoT-Exo-4b. The sudden drop in luminosity is where the planet transits in front of its star. Credits: Aigrain et al. 2008. So how do we detect planets that are so far away — some more than 40 light years from Earth? The COROT telescope uses the transit method, observing the darkening of a star when a possible planet passes ‘in transit’ in front of it. “The variation in luminosity is minute,” explains Olivier Vandermarcq. “It’s a bit like observing 1,000 electric light bulbs from a long distance, then switching just one of them off.” Complementary observations on the ground are thus needed to determine the nature of the object discovered and estimate its size. 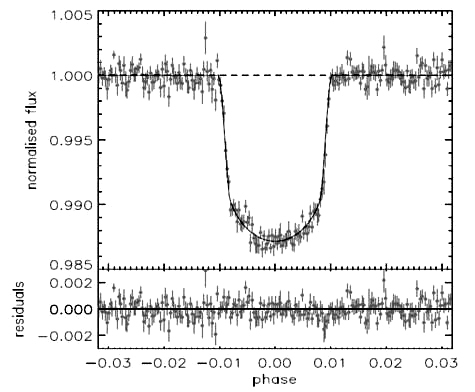 1: Curve showing variation in star’s brightness during a planetary transit 2: Curve showing variation in brightness of a binary star whose 2 components eclipse each other in turn and reflect the light of their companion. Credit: CNES. “And that takes time,” continues Olivier Vandermarcq. “A lot of the information gathered by the satellite has not yet been processed.” To date, more than 200 exoplanets detected by COROT have yet to have their existence confirmed. “Rapid analysis of COROT data is enough to reveal the largest exoplanets. But for the smaller ones, which haven’t yet been really discovered as such, the work is more meticulous,” adds Annie Baglin, mission principal investigator at the Paris Observatory.